Cheap and effective home-made SMS alarm solution. Make a compact alarm device with with minimum effort using PIC clicker, GSM click, Relay click and Motion sensor board. Kit also features right angle GSM antenna, four 1x8 stacking connectors as well as 10 Wire Jumpers (female-to-female). 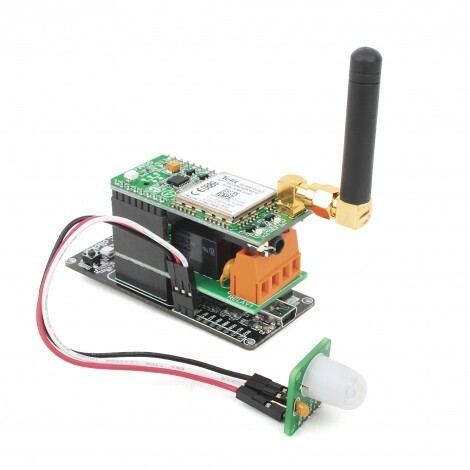 This is revised SMS Home Alarm project with new parts and old funtion - catch the intruder. The alarm is very simple. Once powered up it needs to be armed with a single click of a button. Then it will start to continuously read data coming from motion sensor. This sensor is used to detect movement in indoor perimeter. You can customize the treshold required to trigger the alarm. If a movement is detected system will automatically send SMS to predefined phone number. You'll have 10 seconds to disarm it, or alarm will go off. Siren or any other device can be activated if connected to Relay click boards.